From left to right, IAM Safety and Health Department administrators Anna Georgallas and Kerri Johnson; Scholarship Judges Michael J. O’Leary, Karen Felton, Denise Simmons Graves and Julie Weismantel; and IAM Safety and Health Department Director Mike Flynn. 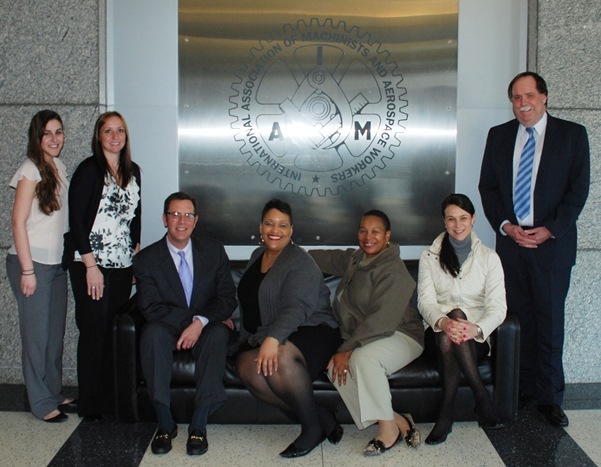 Judges for the 2014 IAM Scholarship Competition recently gathered at Machinists Union Headquarters in Upper Marlboro, MD to review nearly 350 candidates for this year’s awards. Winners will be contacted soon and results will be announced in July. The competition is open each year to all active IAM members who wish to further their education and also to their eligible minor dependents entering college. “The scholarship program is a great way for children of IAM members, and for members themselves, to continue their education,” said IAM Safety and Health Department Director Mike Flynn, whose department administers the popular program. An impartial committee of educators selected 16 recipients for this year’s awards. The four-person panel included Julie Weismantel, chair of the committee and a former Canadian Embassy employee; Michael J. O’Leary, Vice President for Enrollment Management at Goucher College in Baltimore; Denise Simmons Graves, psychology professor and counselor at Montgomery College in Rockville, MD; and Karen Felton, Director of Admissions at George Washington University in Washington, DC. Delegates to the 1960 IAM Grand Lodge Convention first established the IAM Scholarship Fund, which is used exclusively to make these awards possible.